Hudson Music is proud to announce the latest addition to its Master Series of drum instruction DVDs — John Blackwell: Master Series. The third title in the popular series features one of today’s top R&B drummers and showcases the playing that has earned him the drum chair with such high-profile artists as Justin Timberlake and Prince as well as international acclaim in his own right. The three-hour DVD is divided into two main sections. In the first section, Blackwell performs with an all-star band and then explains and demonstrates the drum parts. 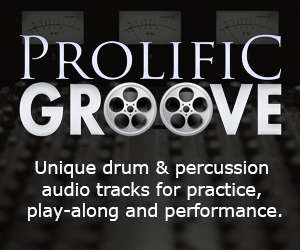 Not only does the master drummer discuss the way the song and groove evolved along with the specific techniques that are involved in the performance, he demonstrates the patterns at normal and slow speeds to provide students with a deeper, fuller understanding of the parts and their musical context. The second part of the program covers topics such as playing musically, grooving and embellishing the groove without over-playing, fills and solos, showmanship and independence as well as Blackwell’s Jazz, R&B and Hip-Hop roots. A bonus chapter on bass drum pedal technique featuring a rare appearance by Blackwell’s friend and mentor Marcus Williams is also included. In addition, a free sample lesson from the DVD along with other online support is available as part of Hudson’s Complete™ multi-media music education system at www.hudsonmusic.com. John Blackwell: Master Series has a running time of 2 and a half hours, carries a suggested retail price of $29.95 and is available at leading drum shops and music stores.